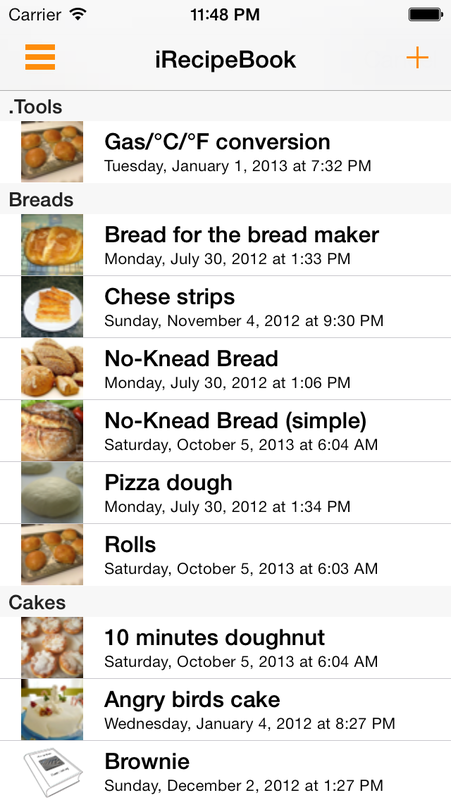 iRecipeBook is an easy to use recipe book application for your iPhone and iPod Touch with web remote editing feature. 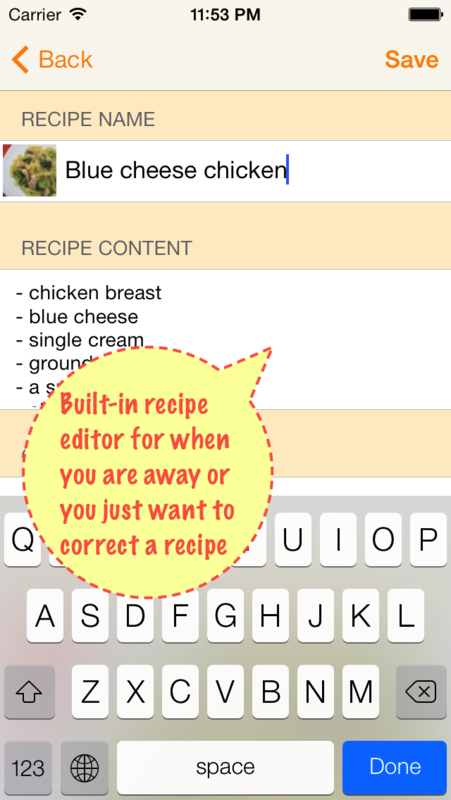 You can enable remote editing from the App, load up a web browser and freely copy-paste and edit your recipes. 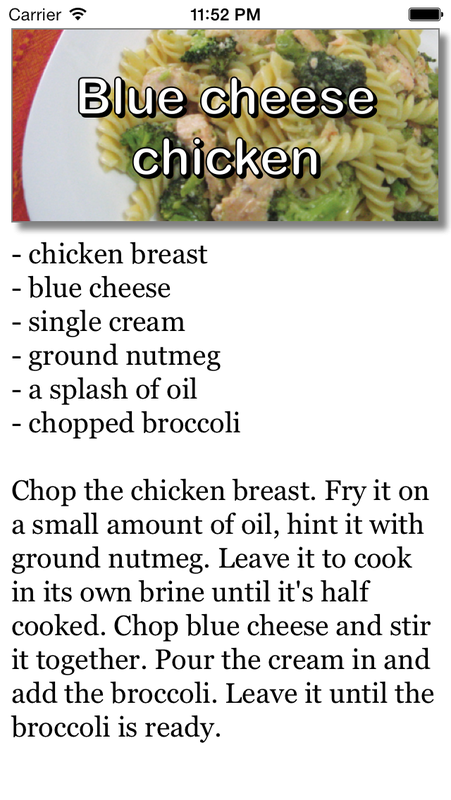 You can easily add lots of recipes with web based copy-paste function. Update: 26/11/2015: Sorry but the app has been discontinued due to administration difficulties and shortage of time. Please don’t report bugs as reviews as it is impossible to reach the reviewers for more information. Please use the feedback form on the support site (this site) so we can actually help you. Please if you have time show your love and update your reviews to the current version so I can support further development! 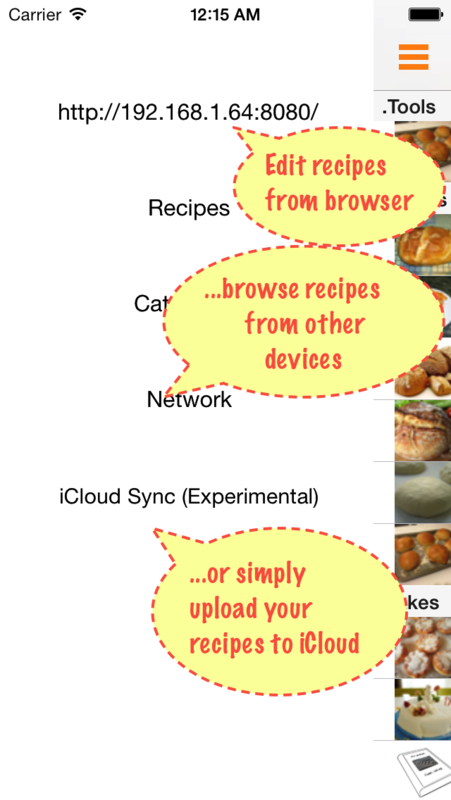 Q: If I use this App, is it possible for me to scan recipes into my computer and save them in my version of the App? A: Web editing means you have WiFi access on your iPhone/iPod Touch and you press the button on the top of the App labeled “Remote Editing off”. This will give you a web address what you have to type into your browser’s location bar on the computer as a normal web address (URL). Please note that the computer has to be on the same network to reach the web editing interface. On your computer from the web browser you can copy-paste into and from iRecipe. A: Please make sure you are on the same Wi-Fi network with your computer and your iPhone/iPod touch. 10.0.1.2 or 192.168.0.1 normally implies the computer has an address from the local network. Your computer has to be on the same network (for example it has address like 10.0.1.3) to be able to connect. Also please don’t complain that you have problem using the admin interface with IE7. Web browsers are not like wine. IE 7 was released in 2006. A: There are several ways to circumvent data corruption problems. First of all, as you should do it with any valuable information, please make regular backups. When you have found your backup file and it’s ready delete all your recipes in web admin / restore menu / delete tab or launch System Preferences on your iPhone and go into iRecipeBook settings, set “Reset program data” / “Delete all recipes” setting to Yes. When you next start your iRecipeBook App it will delete all your recipes, leaving the usual sample recipe to check everything is OK. Please make sure you have quit from the app and you start it, as on multitasking systems it’s not obvious. Q: I need my recipes, in any format! 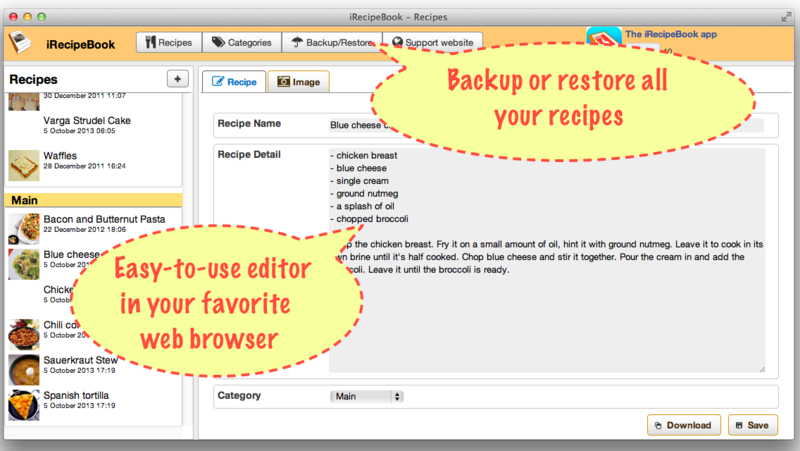 A: You can download the recipes from the web remote editing interface, use the restore menu. The used XML format is basically a Macintosh .plist format, you can find or create tools (we have also plans) to convert from and to this XML format. A: It’s a known problem, correction is on the way. Q: I got a new phone I have lost all my recipes, is there any way of getting them back? A: In the newest version there is a Backup/Restore menu on the remote administration (web) interface that you can access from a web browser. If you are here I suppose you did not make any backups with the application. The second safeguard in the app is iTunes backups. 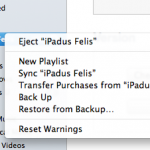 If you have syncronized your phone with an iTunes library and you have backups please restore your backup from the iTunes (right click on the phone and &#8220;Restore from Backup&#8230;&#8221; menu item. As it will restore your phone to an earlier state you might want to make a safety backup of your current state first from the same menu.<br /> If you have no backups from the phone in iTunes either there is no way to restore your recipes so make backups.<br /> I hope you have phone backups in iTunes so you will find your recipes, also when you plug the new phone on an iTunes it will ask if you want to restore and older backup first, it&#8217;s a good idea. 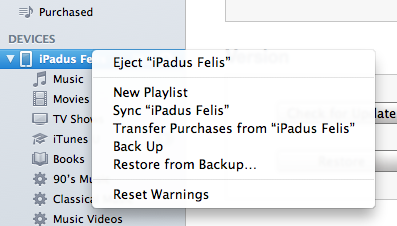 I suppose you did not have backup &#8211; it&#8217;s kind of automatic but you can force backups by right clicking on the iPhone (here I had an iPad plugged in but you can imagine that&#8217;s an iPhone) and choosing &#8220;Back Up&#8221; from the menu &#8211; or you simply chose to create an &#8220;empty&#8221; phone instead. Q: Where are the settings? We are happy to get any feedback from you, success stories, ideas, misfeatures, bugs, even recipes. We don’t receive any information about you from the App, from the admin interface or via Apple. The only information we receive is your e-mail address when you fill the form above. We don’t share this information with anybody.